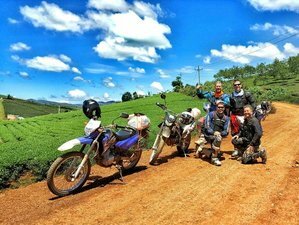 Join this 3-day motorcycle tour with VietnamRider Travel from Saigon to Da Lat, Vietnam. In the beginning of the tour, you will exit the busy Saigon to the quiet countryside in Cu Chi. Along the way, you will pass the beautiful coast, one side is the blue sea and another side is the sand dunes. You will also travel by the small roads through the quiet countryside with many plantations of the cashew trees and dragon fruits! During this tour, you will be accommodated in either a double, a twin, or a private room at standard hotels and homestays. You can upgrade to three or four-star hotels or resorts with an additional cost of 30 to 100 USD per night per room, depending on the season. There is an extra single room surcharge of 10 to 50 USD per person, depending on the location. VietnamRider Travel's guides will help you exit the busy Saigon city to the quiet countryside in Cu Chi. Along the way, you can visit the rice-paper making, the rat-meat village, the rubber plantations, or the historic Cu Chi tunnel where you can do the gun shooting (your option). Continue to travel to the South Coast where the Australian Army used to stay in the Vietnam war. Stay overnight at a hotel in a small town. This road is along the beautiful coast, one side is the blue sea and another side is the sand dunes. This is where the Ho Chi Minh trail at sea was hiding during the war. It's the second part of the heroic Ho Chi Minh trail in Vietnam. You will also visit the famous Long Tan Cross - it's the war memorial of the Australian army in the Vietnam war. Visit the old battlefields of the Australian army at Nui Dat Base and Kangaroo Airbase that all these places are not in any guide books. Relax and enjoy the local foods at the local shops on the beach and arrive in Mui Ne where you will stay overnight at a nice resort on the beach. From the East Coast, you will travel up to the central highland on the height of 1,500 meters, on the west of Vietnam. VietnamRider Travel's team will travel by the small roads through the quiet countryside with many plantations of the cashew trees and dragon fruits. Along this road, there are some beautiful landscape and the minority villages. You can also visit the Pongour - the 2nd biggest waterfall in South Vietnam, and the Chicken Village. Check in your hotel in Da Lat. End the tour. Mr. Nam is the owner of VietnamRider Travel and a tour guide since 1995. Mr. Hung has been a tour guide since 2010. Mr. Rory has been a tour guide since 2010. Mr. Nhan has been a tour guide since 2010. Mr. Tom has been a tour guide since 2010. Mr. David has been a tour guide since 2010. This tour will take place in Vietnam, from Saigon to the South Coast, Mui Ne, and Da Lat. VietnamRider Travel specializes in organizing adventure car or motorcycle tours throughout Vietnam, Laos, Cambodia, and Thailand.